We are a Law Enforcement trained Fingerprinting Service and certified for Federal and State fingerprinting in all 50 States. ACSFingerprinting.com, an Advanced Commercial Solutions company, is committed to offering the most professional service and highest quality fingerprinting to each client - call us at 214-793-1155 for an office fingerprinting service appointment at our convenient location - 1226 N Belt Line Rd, Irving, TX 75061. 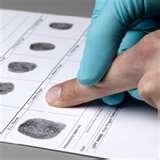 When requested, we will provide proof of official certification to you prior to conducting the fingerprinting process. Additionally, we will provide you with the highest quality of classifiable ink based fingerprinting available in the entire Dallas – Fort Worth Metro-plex. Our work is fully guaranteed. ACS technicians are experts and our staff has fingerprinted thousands of people with an impeccable record of providing classifiable fingerprint recordings. With a fingerprint rejection rate of less than 1%, you can see why we are the TOP RATED fingerprinter’s in Dallas TX! ACS offers the highest quality of fingerprinting work at the lowest prices in the Dallas area and we stand behind our experience and attention to detail. ACS Mobile Fingerprinting maintains an exceptionally low classification rejection rate of less than 1%. Rejections are often due to adverse skin conditions such as medical issues (chemotherapy - exzema), washing hands excessively, dry cracking skin, cracks and lighter ridge detail due to aging, callused fingertips and injuries or amputations. 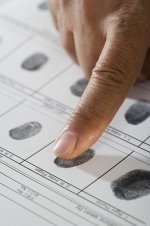 Due to any of these adverse skin conditions, no fingerprint technician has a perfect record. Fingerprint records rejected due to skin condition or the fact that your fingerprint ridge detail is worn or flawed which prevents obtaining classifiable prints, are not our fault and reprints will be at our normal fingerprinting fee." Our pricing structure is very affordable and in line with current industry standards. Our pricing depends on several factors, if you are coming into our office by appointment or we are driving to your location - if we are meeting you at our office before normal work hours or after 5 pm, and of course, for large groups or corporate pricing discounts - simply call us at 214-793-1155 or 214-733-7105 for an instant price quote! If you have called other services for pricing, let us know who it was and what the price quote was and we will try to beat it or match it - in any event, you will get superior service and expert fingerprinting! We stand behind our service and no one can beat that - period. The fingerprinting process is quite simple - you must provide us with picture ID such as a drivers license, State ID card, Military ID card, or Passport. Once we establish your identity, we will have you sign the fingerprint card as well as provide and fill out other required information on the card, we will sign and date it, and then we will fingerprint you. The entire process takes just a few minutes - we know your time is valuable, and whether you come to our office or we come to your location - we offer complete professionalism with a sense of urgency, to get you back to what you need to be doing with minimal interuption. Of course, your personal information which you provide on the fingerprint card stays with you - we do not keep any type of record of any of your information besides your name and address for your reciept. We value your business and the fact that you place your trust in us to properly record your fingerprints for you. We use black ink on the FBI FD258 fingerprint card to record your prints. Additionally we can print on the standard State of Texas DPS fingerprint card if you need that card (Texas CHL) and we also offer a special card to record your childs fingerprints and personal information to be used by law enforcement officials if ever needed. With over 25 years of law enforcement experience, you can count on ACS Mobile Fingerprinting to record your fingerprints correctly the first time! Give us a call today at 214-793-1155 for your quick and easy price quote. ACS Fingerprinting stocks the required fingerprint cards you need, including the standard FBI FD-258 Applicant fingerprint card commonly used for most types of non-criminal fingerprint background checks. Of course, we would like to have your fingerprinting business, but if thats not possible, please go to our Products Page to purchase the FBI FD258 cards. Your fingerprinting service will be completed in accordance to industry standards - Prices charged are for time spent meeting with you at our office or on mobile calls to your location thus, we have a NO REFUND policy - We absolutely guaruntee our workmanship, so if by chance your fingerprints are returned as "unclassifiable", we will re-print you at NO CHARGE in our Irving office - We maintain an extraordinarily low rejection rate - in the unlikely event that you are notified that your prints were deemed unclassifiable, simply call us for an appointment to be reprinted. 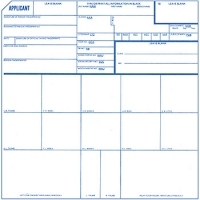 You will need to provide your rejection letter and your reciept at the time of your appointment - We fingerprint for all types of licensing and other needs - it is your reponsibility to know which type of fingerprinting you need - black ink on FBI FD258 cards vs. Livescan (electronic fingerprinting) - there is no refund after we print you.